SAN DIEGO — The saga of serial groper Bob Filner took a hilarious turn Wednesday when it was revealed that the mayor’s lawyer says San Diego taxpayers should foot the bill for any damages resulting from his sexual harassment because he was never given the city-mandated training that informed him it was unacceptable to paw female underlings, request they give up wearing underwear to work and make torrents of explicit sexual remarks to them. Don’t you understand? Filner knew NOTHING! “Berger also states that Filner never received such training as a U.S. Representative and may not know what indicates sexual harassment. But as I wrote for the U-T San Diego, Filner’s political career has intersected with sexual harassment issues over and over again, making his claims to be ignorant of what was right and what was wrong seem even sillier. “The ridiculousness of this claim is underscored by Filner’s own history. He went from the City Council to Congress in 1992, succeeding Rep. Jim Bates, who was done in largely by a sexual harassment scandal that centered on his unwanted sexual advances toward his female staffers. Filner’s contention that he had no idea what he was doing was unacceptable of course evokes Sgt. 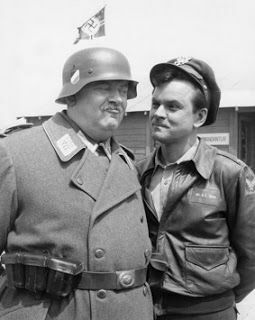 Schultz (“I know nothing!”) — but his whole behavior also reminds of Bob Crane, the “All-American Pervert” who played Col. Hogan. Bonus Wednesday discovery: That Filner shares his birthday with … Anthony Weiner.